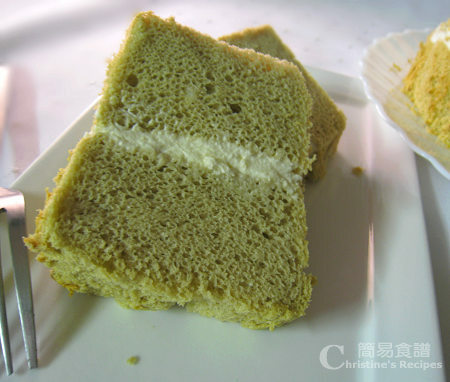 This Green Tea Chiffon Cake is quite easy to make. Once you have got all the ingredients in your pantry, you can bake a beautiful green tea chiffon on the go. My family loves every dessert that made of green tea. When I was writing this recipe, I heard my husband’s voice coming from our kitchen, “Where’s the green tea cake? I can’t find it.” I told him it was put into fridge as it’s got cream on it. Having written up this recipe, half of the cake was gone. Oh dear! Preheat oven to 170C (338F). 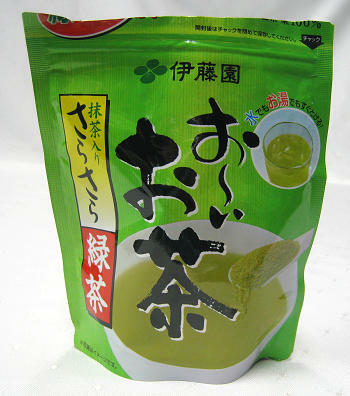 Dissolve green tea powder in hot water (or hot milk). Let cool down. Combine cake flour, baking powder and salt well. Mix green tea powder in hot water/hot milk well. Whisk egg yolks, stir in 30 grams of caster sugar until completely dissolved. Add vegetable oil, green tea mixture, and sift in cake flour mixture in sequence. Make sure to combine and stir well between adding each ingredient. That’s the batter you need. Set aside. Use an electric mixer to beat egg whites until bubbles form. Add cream of tartar. Blend thoroughly, then add one third of sugar at a time. Combine well between the adds, until stiff peaks form. (Please refer to this video, showing how to beat egg whites, on my youtube channel.) Here’s a simple test whether your egg whites are ready or not. The egg whites won’t slip or fall down even if you turn your bowl upside down. Fold in 1/3 of egg whites into the batter. Gently incorporate all ingredients with a rubber spatula. Repeat this procedure with the rest of the egg whites. Don’t beat or stir too hard, just combine well. Transfer mixture to cake mould. Bake in preheated oven for 35 to 40 minutes. Test the cake with a needle. If it comes out clean, it’s cooked. Remove from oven and invert the mould immediately. Let the cake cool completely. Use a knife to run around the edges of mould and take out the cake carefully. 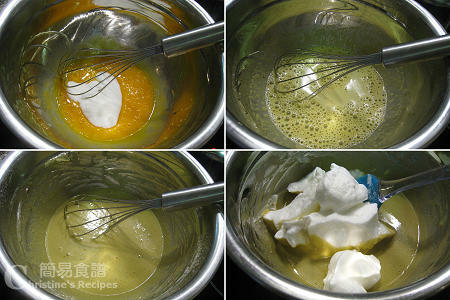 Add caster sugar in fresh whipping cream and beat with an electric mixer until soft peaks form. You might like to sit the bowl on some ice cubes to beat whipping cream in warm weather. I skipped this step when the weather is cold. Most importantly, chill the mixer and bowl in fridge before beating, that would help you to get better results. Chill the beaten cream in fridge for 30 minutes. Cut the cake into halves and spread cream evenly as picture shown. Done. I have never tried making chiffon cake so far as I know the mixing part is very challenging. After reading your success story and looking at your marvellous cake, I am so inspired to try it out now! Will definitely bookmark it. Tks! Yay, not only is the green tea cake a big hit in my family, but also amongst my blogmates. You're absolutely right. The mixing part is quite challenging. But once you have the skill of folding in egg whites, you'll make it. The secret is "lightly fold with vertical motions", scraping the mixture from the bottom to the top, not stirring it. Hope you make the first chiffon cake successfully. Thanks Christine for translating this! This looks extremely light and fluffy! Another great recipe using matcha! I guess you're a big fan of matcha! Am I right? i've tried this recipe twice now, but the batter separates in the oven and ends up just tasting like egg. :( i've had to trash both batches. sorry for hearing your bad news. It could be the problem of beating egg whites, very typical issue. i'm a uni student in australia and i stumbled upon your blog by chance.i had so much fun looking through your recipes and now my housemates think i can cook like a pro because of your recipes!and they're ridiculously simple to make and yummy! Just wondering are the oven temperatures mentioned in all your recipes for conventional or convection ovens? Thanks. Thanks for dropping by and leaving your kind words. So you have to cook by yourself, right? Hope my recipes can help. You'll easily find all the ingredients here in Australia and cook good foods for yourself. Did you subscribe my blog? You won't miss any updates if you have subscribed. The temperatures mentioned in my recipes are for conventional ovens. BTW, please note that the temperature of every oven would be slightly different. You have to observe and adjust by yourself. Hi Christine, I tried this recipe a few time but the cake still collapse at the end. The egg whites is fine, they passed the upside down test....just don't know why it has not been working for me? Great, you've beaten egg whites that passed the test. The mould is very crucial for baking a chiffon cake as well. What kind of mould did you use? The one should be non-stick. Once the cake has puffed up, it'll stick to the sides of the mould and would not collapse then. Is it necessary to use the tube ring pan for this cake? I don't have one.. will a springform pan work as well ? or a square baking dish ? Not necessary, but it helps to produce the best result. Is it okay to not add the green powder? Would it still taste sweet, like the regular cream flavor at the bakery? And have you tried making a chocolate/mocha flavor? I am in the US, so cake flour is coming I can find in asian stores? Also, caster sugar is powdered sugar? Your website is fabulous! I discovered your blog last week during lunch, the food you make are so yummy looking! Love your blog! Do I need to grease the chiffon pan? It's okay if you don't add the green powder. The taste won't be the same as mine, of course. Yes, I baked some chocolate cakes before. Caster sugar is very fine sugar, but not in powder form. Thanks for your love of my blog. Welcome you to come back and visit again. For baking this cake, you don't need to grease the chiffon pan. The cake would deflate after cooling down otherwise. Not sure if my previous comment got through, but just wanted to ask if I baked this cake in a 10 inch chiffon pan instead of a 8 inch pan, should I adjust the temperature and baking time and by around how much? Thank you. Yes, adjust the baking time as the width and depth of your batter in mould are different. The cooking time would be shorter, the range be 5 to 10 minutes. As the temperature of every oven is different, the time suggested in the recipe is only a reference point. Your chifon cake looks amazing! I was wondering, if I wanted to make coffee flavour chifon cake and vanilla flavour chifon (like in the chinese bakeries) what and how should I substitute the green tea powder? Hi Christine, is cake flour same as self-raising flour? I can't find cake flour at my local supermarket. Cheers Jan. The cake flour is not the same as self-raising flour. I got the cake flour at Asian stores. If I was to use instant coffee powder (instead of green tea powder), would that work? How much should I use? It would work for sure. Just substitute 1 tablespoon of instant coffee powder, or adjust the amount to your liking, that depends on how strong you like the coffee flavour. Where did you purchase the chiffon pan? I cant seem to find any that is not a non-stick. Th chiffon baking pan in the picture was bought from Hong Kong. But I also found some available at Robins Kitchen here. They are non-stick too. Thank you for the great recipe - I successfully made it this morning. Just one thing though: how do you remove the cake from the mould without tearing off all the lovely brown skin? I used a knife to run around the edges of the mould, but when the cake came out, the brown skin was still stuck to the mould and the cake came out without a skin (and also had some chunks missing from the body which were still stuck to the mould). Congrats on your baking success. I also use a knife running around the edges of the mould. It's better to use a very sharp knife with a saw blade. That's much easier to remove the cake. i've just tried making a ciffon cake but it didnt raise as much as ur cake does. Any tips on this? 1. Beat egg whites to stiff peaks form. 2. Fold in, not stirring, the egg whites lightly. Then you can keep the air inside. 3. Don't open the oven door while baking. Otherwise the temperature would decrease and the cake would shrink back. as for the fold part, let's say i was doing in another bowl then i need to pour the batter into the baking pan, by doing this, will it loose the wind? or i should juz fold in in the baking pan itself? You might like to view them and get the idea of how to go about beating egg whites and folding in the egg whites. As for folding in egg whites, I often use a large mixing bowl, then transfer the final batter into a baking tray. If you use a baking tray to do the fold-in job, it's quite difficult because a baking tray is quite small, too shallow or too wide. So, it's no problem of using mixing bowl. I've tried the 2nd time, the cake raise when it's baking, however it shrink once it's almost done, any idea how come it'll be like this? 1. Egg whites to form stiff peaks? 2. Lightly fold in egg whites? 3. Not used non-stick baking mould? 4. Not open oven door in the process of baking? If not, a chiffon cake would shrink then. It's very difficult to bake a chiffon cake in a square pan. As you know that the center of the cake is hard to be cooked through, and the cake will easily shrink once it's removed from oven. That's why a tube pan with a removable bottom is preferable. Oh, thanks for your kind words. Hope my recipes help you. Thank you for your love of my blog. You can just skip the green tea, you'd get plain chiffon cake. Hi Christine, I tried this recipe a couple times but my chiffon cake did not turn out right. The inside of the cake does not get cook. The tooth pick always come out with a little bit of batter. I added 5 minutes each time I tested it; and baked total of 55 min. The outside of the cake is very brown but the inside appears to be uncook. I use a fluted cake non-stick pan very similar to yours, my egg whites pass the upside down test, I fold them in exactly according to your video. I baked at 338F. What can be wrong? I see the picture of your cake and it really inspired me. Can you help? @Fong：From reading what you did and used, the cake shouldn't be like that, supposed your oven works well. Did you follow my recipe? Or what ingredients did you add into the batter? Christine, I am Fong, so happy to hear from you. I followed everything with two exceptions. 1. I used lemon juice instead of cream of tartar and 2. I forgot to add the salt. My oven is quite new, less than two years old. Do you think these two things made a difference? Can my American oven be different from yours oven in Australia? I am wondering if I should try baking it at 350F. Some American chiffon cake recipes are baked at this temperature. What do you think? I do want to try this again once I hear from you. And thank you so much for posting your recipes. I am learning a lot and my family loves the food. I used the tangzhong method for all my breads now. I am becoming addicted too! Thank you again. Look forward to hearing from you. It's not the problem whether it's American or Australian made oven, as long as the temperature is right. Just wonder what size and model of your oven you used. Did you have the same problem, with the middle part uncooked when baking other cakes or other foods? You said that you baked the cake at 350F, that's fine. It seems that you did everything correct. The lemon juice and salt were definitely not related to the uncooked middle part of your cake. The problem was probably caused by your oven. That's all I can say. Christine, I decided to invest in a kitchen scale. I tried this recipe and weighted the ingredient and the cake turn out perfect, very light and delicious. Why do we need to chill the beaten whipped cream in the fridge for 30 mins before use? Is this apply to all the whipped cream. Hope to hear from you. Chill it if the weather is warm in order to get it stiffer. Christine, thank you for your advice. When you mentioned to mix the green tea powder with hot water, how much water exactly do you add? I am going to try your recipe with two round baking tins and apply the whipping cream between the two cakes. Do you think that will work? Please refer to the "Ingredients" section in this recipe, just mix the 3 Tbsp green tea powder into the 120 ml hot water/hot milk. Yes, I think it works. Adjust the baking time accordingly. Hi Christine, I have done this recipe and I love it!! I am a big fan of matcha so it worked out really well. I'm doing it again soon but reading over, you forgot to mention when to add sugar and cream of tartar to the egg whites? Does it really matter when you add it? I can't remember from when I made it haha. Oops, how could I leave that part out? Thanks for your feedback. Updated the recipe. Hi Christine, thanks for the recipe, tried it out today and turns out really nice. However personally I like dry chiffon cake so should I just increase the duration from 35 to 40min, or using water instead of hot milk will make it less moist? Thanks in advanced! 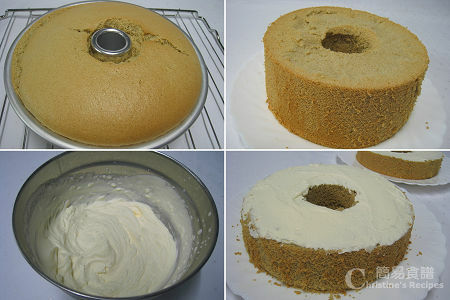 Simply bake for a few minutes more to get your chiffon cake dry. Every oven is very different. So the baking time can be different for different ovens. Thank you SO MUCH for your delicious recipe!!! My cake turned out better than I thought it would!!! It was as good, if not better, than the best green tea chiffon cake I had tried (made by a Japanese woman)!!! The only "personal touch" I added was to thinly shred some white chocolate into the filling. With or without it, this cake was a SHOW STOPPER!!! I just baked this cake for the third time and it turned out better than the previous two times. The only things that bother me were the bottom of the cake gets stuck to the mould and is hard to get out. I hesitate to use parchment paper as it might cause the cake to flip out when it is turned upside down. The second problem is the top of the cake is sometimes crackly and the sides a little yellowish brown. I think that might due to the heat distribution. This cake is definitely a keeper. Now I just need to figure out how to make the top and sides of the cake look nice! Thank you! I've being pretty successful with ur baking recipes sp far, so easy to prepare! One thing is, the baking side up (bottom side after removing the mold), never seem to dry off, it gets so sticky all the time, i try to makecupcakes with this recipe, nevermibd that it sank in a kittle bit, but cooling off overnight doesn't help to dry the top, is there another option besides chopping it off? The icing won't sit well as its affixed to the moist top. Did you let your cake sit on a wire rack to cool down? The moist should escape through the rack. i tried this recipe last night, but the bottom of the cake cracked while in the oven. Is this because the eggs are not at room temperature? It shouldn't be the temperature of the eggs because some people also use chilled egg whites and it didn't make the cake bottom crack. Wonder if you are talking about the top or bottom of the cake cracked? It's quite common that the top of chiffon cake cracked while baking. Just reduce the temperature of your oven a bit. It might help. But, if the cake base cracked, it's not a common problem. Interesting! I'm confused as to which flour to use? Is it actually called cake flour (like on the packet/box)?? There's so many other types of flour i can buy in a asian shop, i don't know which one's the right one. Yes, on the packet, it's written as cake flour or low gluten flour (低筋粉). You can get it from any Asian grocery stores.